There are many mythical based themes in online casino slots that have become popular. But the most powerful one is Hercules High and Mighty because of the strength this mighty war hero possesses. His valour and power can be experienced in this five reels slot that offers a massive hundred paylines to win from. The reels are placed over the rich background view of a citadel with flames in the air. There are some cool sounds effects given to the game during the spins. It also has big bets options that create a perfect opportunity for winning bigger rewards. The wagering starts with £0.10 per spin and that can be raised up to £250 a spin. This amazing game based on a legendary mythical warrior was developed by Scientific Games. One of the most preferred brand names in the casino industry; both online and land based due to their popularity and best in the class gaming experience. Visually, Hercules High and Mighty slots have a colourful graphics with symbols that are popular Greek mythological characters. King Zeus, Queen Alcmene, Hydra, Pegasus, Lion and Cerberus are the base symbols. The lower valued ones are from playing cards; hearts, spades, clubs and diamonds. The top payout symbol is King Zeus who awards you with 250x on your stakes with five of its kind on the reels. The card symbols pay you 50x each when five of their kind appear. There are two additional symbols to help you activate bonus features and they are the symbols of a gold coin and the Hercules himself. 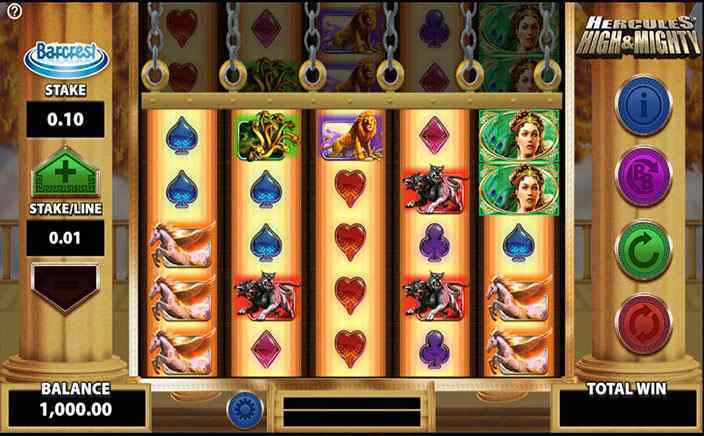 Wild Feature: The symbol of Hercules is the wild feature of Hercules High and Mighty slots. Wild substitutes for all the symbols in the game except for the gold coin. Scatter Bonus: The gold coin symbol awards you 8 free spins with 3 scatters, 12 spins with 4 and 20 spins with 5 symbols anywhere on the reels. These spins can be re-triggered anytime. Big Bets: There are three levels of big bets that you can pick from. The £20 bet with five spins and expanding wilds that activate ten reels, £30 with expanding wilds without card symbols and £50 with an additional feature of sticky wild until you win. 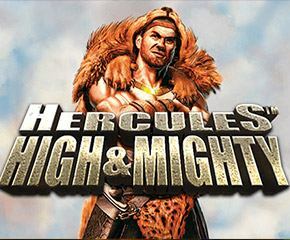 Hercules High and Mighty slots is one of the very few games with big bet option to help you win big. A hundred paylines creates plenty of opportunities to win that makes it a game with better win probability.